Here you could enjoy real Neapolitan Espresso and have typical Italian breakfast with tasty cream croissants. Safé is a very small but pretty coffee shop. The atmosphere inside is quite distinctive: a flag of Naples and a picture of Toto and Peppino just above the coffee machine. 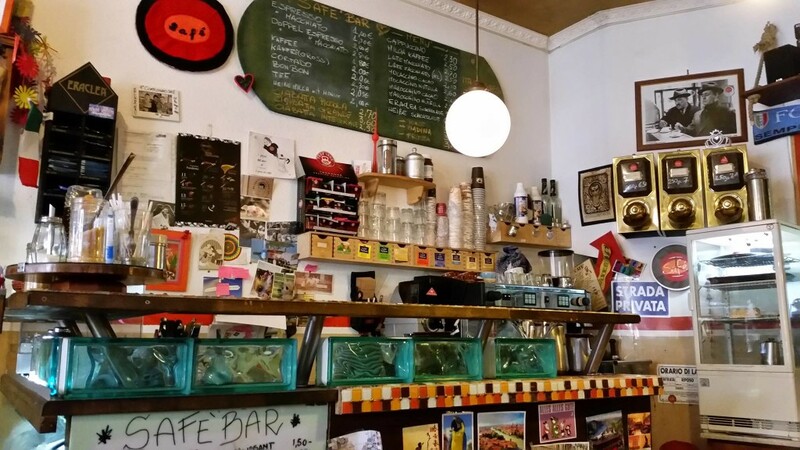 It is located in Ostkreuz, one the liveliest neighbourhoods of the city; here, coffee is grinded instantly and it can also be sold at a retail price. “The coffee shop name comes from the initials of our names, Sandro and Federico. In 2001 I went on Erasmus in Berlin. In 2005 perspectives in Italy were not so good. I used to live in Spain and London but I eventually decided to settle in Berlin. I love the atmosphere of this city.” “Have you ever thought of coming back to Italy?” “Just for holidays. My girlfriend is from Brandenburg. We’re fine here. Our son is perfectly bilingual, there’s no reason why we should move from here”, Federico tells us.